The Freeze flavors at your local Taco Bell seem to be working through every flavor of candy you picked while trick-or-treating as a kid. The Freezes have been flavored with Pop Rocks, Airheads, and Starburst previously. (And also Mountain Dew.) The latest outside the bun flavor follows the rule. 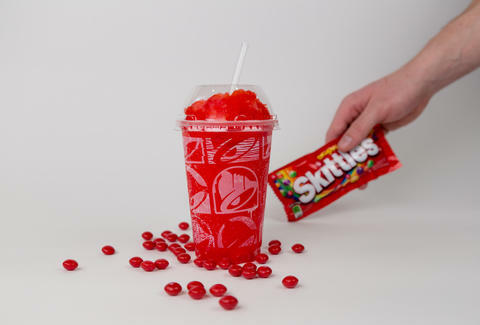 Taco Bell just announced the release of Skittles Strawberry Freeze. In the release, Taco Bell writes that you can "drink your favorite Skittles candy flavor for the first time." Skittles super-fans will remember there was a green apple Slurpee at 7-Eleven a couple years ago. Taco Bell clearly doesn't think green apple is your favorite since green apple is to a bag of Skittles as the banana is to a packet of Runts. If you're on the fence about Skittles-flavored drinks, you can give it a shot for pretty cheap. The Freeze is $2.29 for a regular and $2.59 for large starting on March 8. However, participating restaurants are running a happy hour for the Freeze. From 2-5pm daily, you can pick one up for $1. Add the happy hour Freeze to the list items you can now pick up for a buck, which includes those wildly popular nacho fries.